The Holy Father, Pope Benedict XVI, has announced that Bishop Bernard Longley, currently Auxiliary Bishop of the Archdiocese of Westminster, will be the next Archbishop of Birmingham. 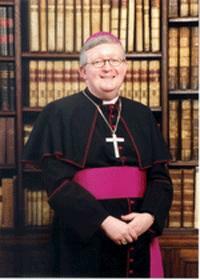 Bishop Longley was named the ninth Archbishop of Birmingham on 1 October 2009. He succeeds the Archbishop of Westminster, the Most Reverend Vincent Nichols (2000-2009). On learning of the Papal announcement, the Archbishop of Westminster, Vincent Nichols said: “I welcome the news of the appointment of Bishop Bernard Longley as Archbishop of Birmingham. I am confident that he will be warmly welcomed, right across the Archdiocese: in Stoke on Trent, Stafford, Wolverhampton, Coventry, Birmingham, Worcester and Oxford. The clergy, religious and laity of the Archdiocese will appreciate the qualities he brings: his gentleness and sensitivity; his firmness and intelligence; his profound and joyful faith; his willingness to listen. After receiving news of his appointment, Bishop Bernard Longley said: “I feel immensely honoured and very humbled that the Holy Father has appointed me to succeed Archbishop Vincent Nichols as Archbishop of Birmingham. I look forward to serving the Priests and Deacons, the Religious and all the People of the Archdiocese and to working alongside my brother Bishops there. I also look forward to knowing and appreciating the life of the Diocese and the many ways in which it reaches out with the love and truth of Christ, in its parish and school communities and through ecumenical and inter-religious friendships. I am grateful to Bishop William Kenney for his faithful service as Diocesan Administrator over recent months and for the welcome that he has already shown to me. Bishop Longley will be Installed as Archbishop of Birmingham at the Metropolitan Cathedral and Basilica of Saint Chad on 8 December 2009, Solemnity of the Immaculate Conception and one of the patronal feasts of the Archdiocese (St Chad being the other).